When was the last time you personally cleaned (or even looked at) your gutters? It’s probably been a while, understandably, but with leaves falling and winter fast approaching, having your gutters inspected and cleaned should be on the top of your to-do list. Putting it off can mean encountering some undesirable things later. I can not believe I am even posting this picture of a snake on my blog as I had snakes but after learning this is a real thing consider it a PSA. 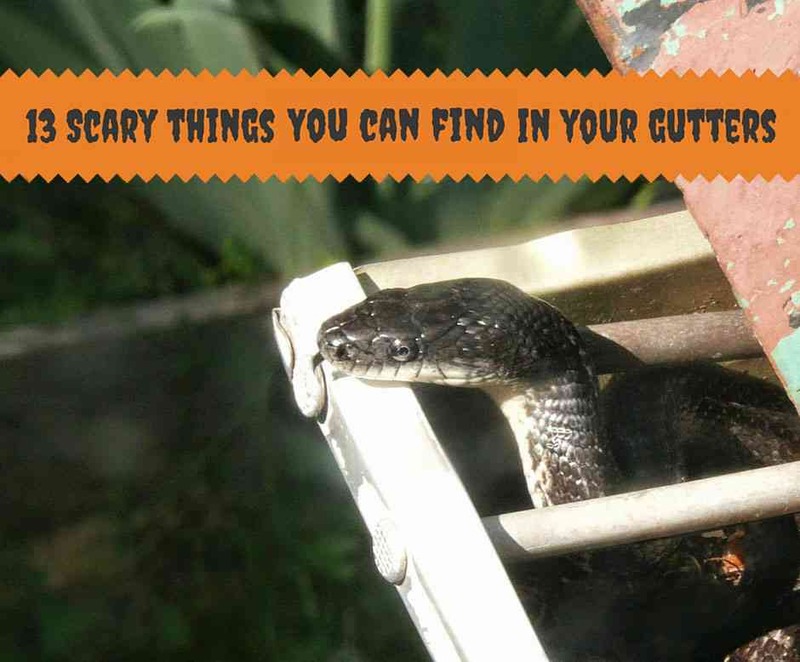 From gross to scary, here’s a list of living creepy crawlies (and one inanimate object) you can find lurking in your gutters this time of year. Trust us, you don’t want to run into any of these. No one loves spiders. While they might play a role in maintaining the environmental balance, no one wants them in or around their homes. Unfortunately, when gutters aren’t maintained properly, they become a haven for all kinds of spiders. We can already hear the screams from the rooftop. Sure, chipmunks are cute. There have even been movies dedicated to singing ones. But you won’t be excited when Alvin and the boys start storing their winter stash in your gutter system. And getting rid of them is a process you don’t want to deal with. No, we aren’t talking about the cute one from Pocahontas. We mean the devilish fiends who crawl up your gutter system, wreaking havoc along the way. Believe us, it won’t be fun when you find yourself face to face with one of these bad boys. These reptiles are harmless, but that doesn’t mean you want to see them in your gutters. They too closely resemble their cousin, the snake. Gross, man. GROSS. While the plants growing in your dirty gutters won’t be as bad as the ones in Jumanji, they can cause quite a lot of trouble. From grasses to trees, plants can break down the gutter system, and that’s just no fun. As a famous city girl once said, “A squirrel is just rat with a cuter outfit.” While you might be under the impression that squirrels are cute, just wait until you run across a mother squirrel protecting her babies, or worse, a dead one. Have you seen The Birds? Maybe you read the book. Either way, that behavior is what you can expect when disturbing a family of nesting birds, even by accident. From a bird’s perspective, a gutter seems likes a nice place to put down some roots. But really, they just end up blocking your gutters, which can cause some serious roof damage. Listen, mice can make cute pets, but they do not make cute gutter-dwellers. Where there is one mouse, you will find another. Plus, these pesky rodents will attract much scarier animals. Keep reading. Did you know that frogs not only can live in your gutters, but they can lay a whole family of tadpoles in there as well? True story, bro. And believe us when we say, that you don’t want them lurking in your gutters. Especially when it comes time for those babies to get their legs and start hopping. You will be overrun with frogs. While it might have been all the rage to have an opossum grooms cake in The Steel Magnolias, you won’t have similar feelings when you see one lurking in or around your gutters. They hiss. It’s not fun. Yes, you read that correctly. Snakes crawl into your gutters in search of the other animals that seek shelter there, like frogs, squirrels, chipmunks, and birds. Just imagine seeing a snake slither out of your gutter or hanging over your door. That thought alone is enough to make you want to call a professional. You’re probably thinking, “Oh, toys. That won’t be so bad.” You would be wrong. Remember that scene from Toy Story, when Woody meets all of Sid’s toys of horrors? That is what awaits you in your gutters. It will be like the toys from horror movies. Prepare yourself for nightmares, friend. If you are planning on cleaning your gutters, be prepared to encounter one or more of these lurking around. Better yet, call Ned Stevens to take care of it for you. They definitely don’t mind getting their hands dirty and facing off the scary creatures lurking in your gutters. What is the craziest thing you found in your gutter?